Grab a bite to eat at the The Planters, a restaurant where you can take in the pool view and dine alfresco. Or stay in and take advantage of the 24-hour room service. Unwind at the end of the day with a drink at the bar/lounge or the poolside bar. A complimentary buffet breakfast is included. 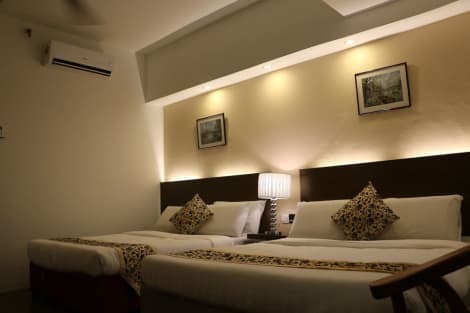 With a stay at Azio Hotel & Residences, you'll be centrally located in Langkawi, a 1-minute drive from Night Market and 6 minutes from Eagle Square. This hotel is 12.7 mi (20.5 km) from Pantai Cenang Beach and 12.5 mi (20.1 km) from Cenang Mall. With a stay at Amara Guest House in Langkawi (Kuah), you'll be within a 5-minute drive of Kuah Jetty and Night Market. 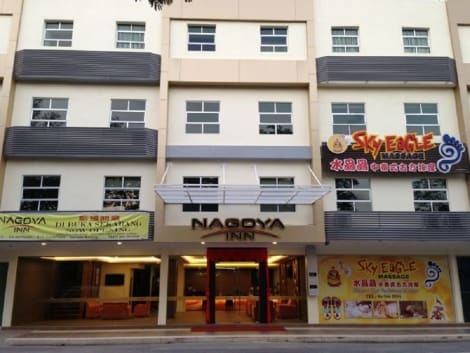 This hotel is 1.1 mi (1.8 km) from Eagle Square and 1.2 mi (1.9 km) from Langkawi Terminal Ferry. Stay in one of 42 guestrooms featuring LCD televisions. Complimentary wireless Internet access is available to keep you connected. Bathrooms have showers and hair dryers. Make yourself at home in one of the 128 air-conditioned rooms featuring refrigerators and LCD televisions. Complimentary wireless Internet access keeps you connected, and cable programming is available for your entertainment. Private bathrooms with showers feature complimentary toiletries and hair dryers. Conveniences include desks and coffee/tea makers, and housekeeping is provided daily. Make yourself at home in one of the 74 air-conditioned rooms featuring LED televisions. Complimentary wireless Internet access is available to keep you connected. Private bathrooms with showers feature complimentary toiletries and hair dryers. Conveniences include phones and coffee/tea makers, and you can also request irons/ironing boards. With a dramatic but fitting nickname of the Jewel of Kedah, Langkawi in the Andaman Sea in Malaysia is a stunning destination with must-see sights and beautiful relaxing spots to escape to. Kuah is the biggest town of Langkawi and one of the major pulls for anyone visiting is the duty free shopping there. But there are lots of other things to do during your trip. Getting out into the local countryside should definitely be top of your list when you visit Langkawi. You can arrange jungle treks through The Kilim Karst Geoforest Park to see the wildlife, or for an experience to remember, walk along the Langkawi Sky Bridge which teeters over the rainforest canopy. If you'd like to see the sights in a more laid-back way, grab a cable car for a bird's eye view without the effort, and for beachgoers, spend a day kicking back at the beautiful Cenang Beach. There are lots of activities and entertainment venues to explore too. For starters, try the curious Art in Paradise museum and check out the 3D wonders. To get the most from your trip, try a traditional Malaysian restaurant to sample the local cuisine. Fat Cupid is a favourite with travellers, but for something a little closer to home go to Coco's Bistro which serves a mix of dishes including British, or even try Korean treats at Haroo. When it comes to looking for a Langkawi hotel, there's a real range so you can pick the best one for you. At one end of the scale, 5-star retreats include The Danna Langkawi, Malaysia and The Datai Langkawi, while more budget-friendly places include the Tropical Resort and Cenang Memories Motel.